You know I’m a big believer in saving energy and more importantly, saving energy with lighting control. I had the opportunity to walk through a home the other day that utilized many green technologies in it’s finishes, one of which was LED pot lights. Now most people know that I’m not a huge fan of LED’s or CFL in most situations, although I am slowly warming to LED if used properly. Now it this application, the lighting was a traditional 5″ pot with a LED pot light with a screw in Edison base. This is becoming a very popular retro fit bulb because it can be used so effectively in some many applications. Unfortunately most often these LED bulbs aren’t dimmable and the ones that are dimmable usually can’t keep a consistent colour temperature as they dim, not to mention flickering, etc. Now back to the LED pot lights in this home, I took a quick reading with my whitegoods app that takes suprisingly accurate measurements. 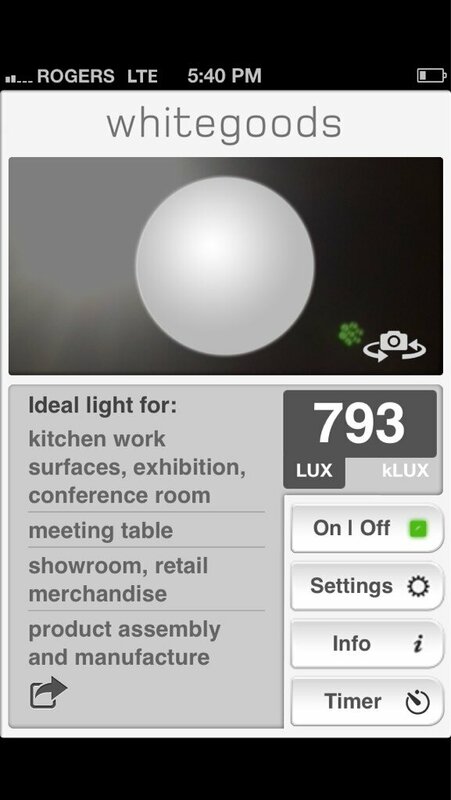 This is the reading I recorded – 793 LUX – taken with one of these LED bulbs directly above. Now take a look at the recommended uses of this light level: Kitchen work surfaces, meeting tables, showroom, retail, exhibitions, etc. None of these really say ‘Home’ to me. Granted kitchen work surface is in there but that’s the only one and it’s also the one location in the home where you would want an incredibly bright light. So I know you’re wondering if I found these lights over the kitchen counter work surfaces… well it rhymes with no and well it’s just no! I found these lights in a family room sitting area. All I had to do was walk into the space and could visually see the issues brought about by this bulb type. Not something I’d want in my house, and definitely not something I would spec for a client. That being said there are some way to utilize LEDs in your home and have a much better lighting experience! Use LEDs that are dimmable – Not all bulbs are dimmable, and even some dimmable bulbs say they’re dimmable but not reliably so. You want a dimmable bulb that allows smooth dimming to at least 5%. Use high quality LEDs that are colour matched and will dim within its dimmable range while maintaining that colour while dimming. Don’t use LEDs! You can use a high efficacy halogen in conjunctions with a dimmer to achieve huge bulb lifetime and very good energy usage. @OmegaAudioVideo the cost for LED has come down in price over the years but still expensive; especially if you have over 48 pot lights.